The Samsung Galaxy Note8 will get the Android 9 Pie firmware update sometime in February while the Samsung Galaxy S8 and S8+ are expected to get it a month later in March. The information comes straight from Samsung’s own update roadmap, featured in the Samsung Members app. It’s a bit unusual for a Galaxy Note device to beat a Galaxy S device to a major OS update, given their respected market releases. But keep in mind that this specific roadmap regards a specific market, not all markets globally. 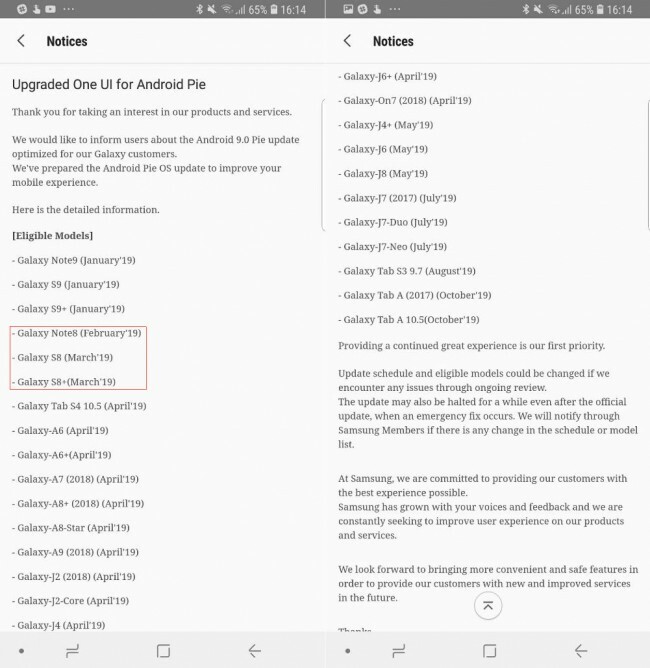 Samsung Turkey’s roadmap has the Galaxy Note8 and the Galaxy S8 and S8+ as in line for the Android Pie update in February. Meanwhile the Galaxy Note9 is currently undergoing its Android 9 Pie beta testing phase, but is expected to receive the final Android 9 OS update this month. The Galaxy S9 and S9+, meanwhile, received Android 9 at the end of December.